I know, I know. 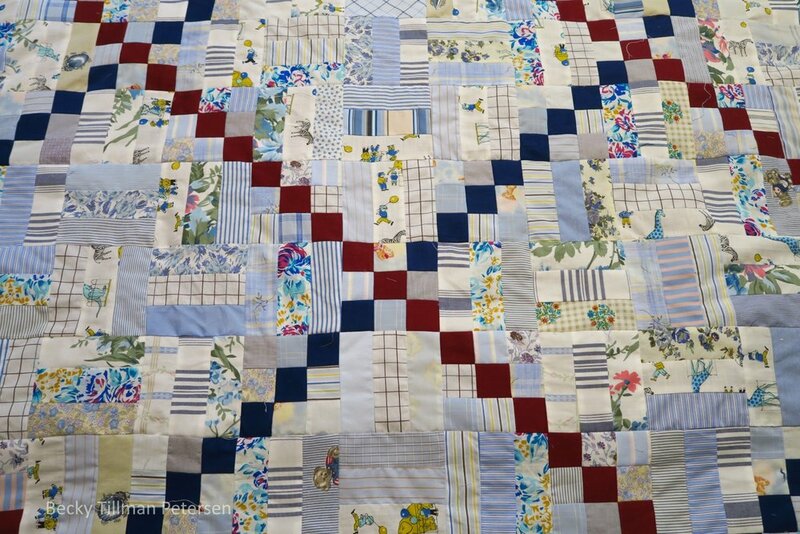 I think you thought I had forgotten about this “upcycled blues” series of quilts. Well, I’ve not. 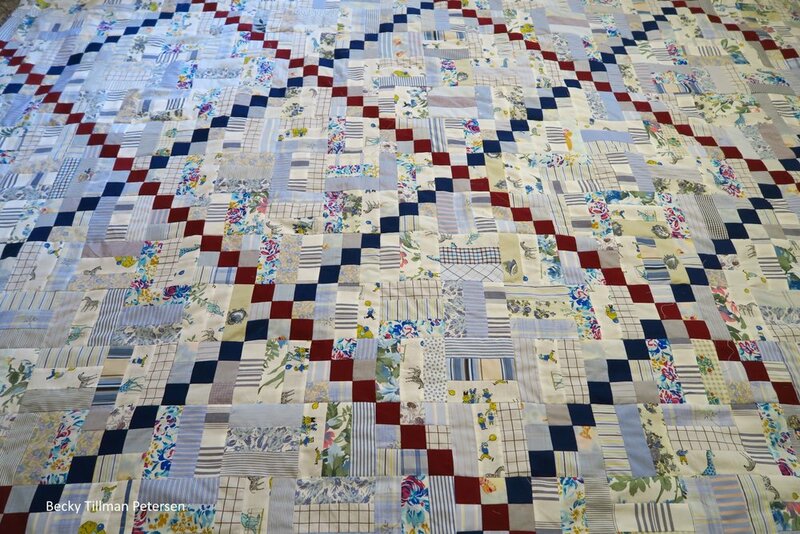 I will not tell you how I’m doing on this series so far, as you will find out over the next few weeks, but I will tell you that I do have two more tops to finish up AND a lot more quilting to do. I’m calling one of those unfinished tops Pick a Pocket and the other one is Hawaiian Dreams. Pick a Pocket is started - just have more to do on it. Hawaiian Dreams isn’t started yet. I think it will go together rather quickly, though, as I’m leaving some of those Hawaiian fabrics in large pieces so we can see the beautiful prints. 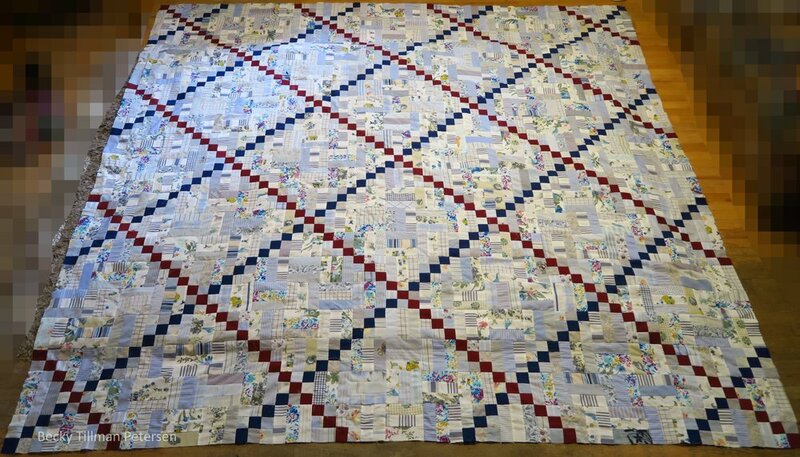 I have the fabrics all put to one side. This one is number 40 in my upcycled blues series. I thought it would be about 10 quilt tops in total. This top I actually finished a few weeks ago now. I STILL had too many lights compared to darks in my blues boxes so I decided on a simple chain and rail fence quilt using mostly lights/white background with dark blue and just to make it interesting, a burgundy chain. I will say that these last couple really did a lot to diminish my boxes of blues. This one made it so my lights box is pretty empty. The navy and burgundy didn’t even start out in the boxes, so they didn’t change the status of my boxes at all. I put the remainder of those back on my shelves since both of them were duvet covers/sheets. This is the chain block. This is the rail fence block (in between the chain blocks). It’s simple. It was fun. It was easy and quick. If you happen to have a lot of lights that you aren’t sure what to do with, this would work for you. just choose two nice dark fabrics that will contrast nicely with your lights - for the chains - and go for it! The pattern is ready and it’s on the free patterns page here. 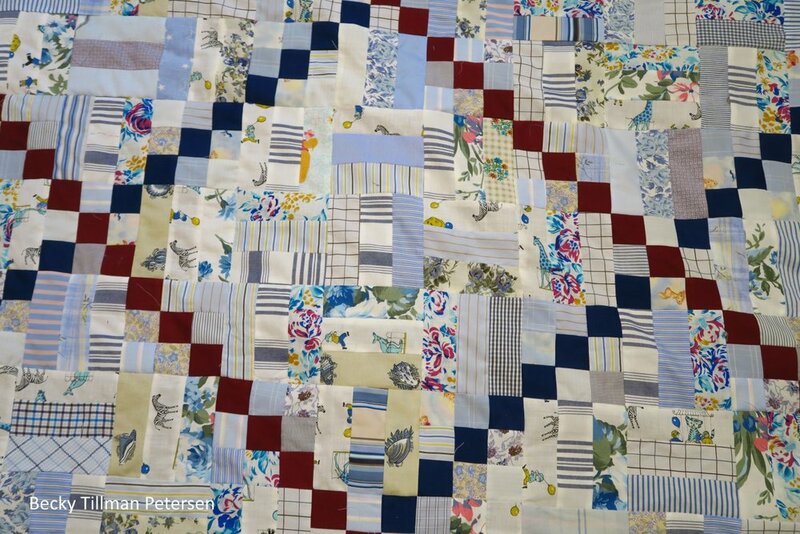 I’ve also updated the upcycled blues page with this newest top. Remember you can always go there to check and find out where I am in this series if you happen to miss some of my blog posts. Someone asked me a while ago what colors I would tackle next. I have been thinking about it, and I think I’ll do some greens/pinks or greens/purples, or greens/pink/black combo. And that’s what I’ve been up to - or at least one of the things I’ve been up to lately in my sewing room!